This was Leek’s first away match of the season, having drawn their opener 2-2 with Spalding, recovering a point from 2-0 down. Despite the shaky start at home I had high expectations for their first away game. 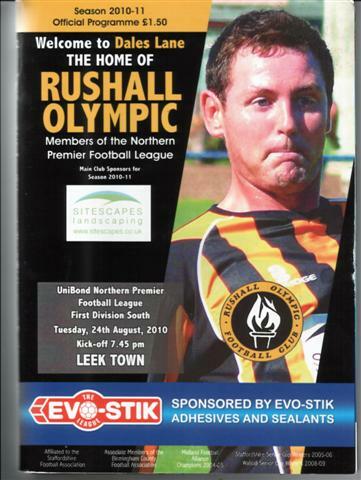 After a great start Rushall finished, like Leek, mid-table last season. They are the highest placed of the four non-league clubs of North Walsall, at step four. The others – Pelsall Villa, Walsall Wood and Bloxwich are all at step six. Rushall date back all the way to 1893, although the club disbanded shortly after the war to be reformed again in 1951. They won the West Midland Regional League in 1978 and where they are now is their highest pyramid position. Dales Lane looks quite ramshackle in places but very smart in others. It is a very flat ground, geographically speaking, with no elavated views at all, even from the main stand. This main stand seen from the ends just looks like a covered terrace. It is only when you get up close you realise it has seats. 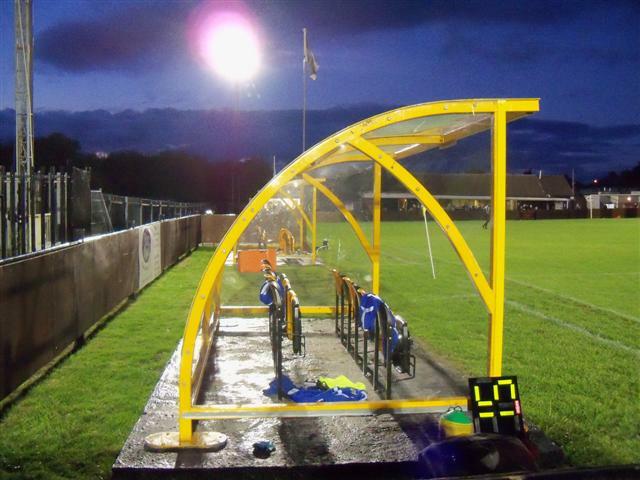 The covered stand stretches quite a distance but apart from this there is just hard standing. 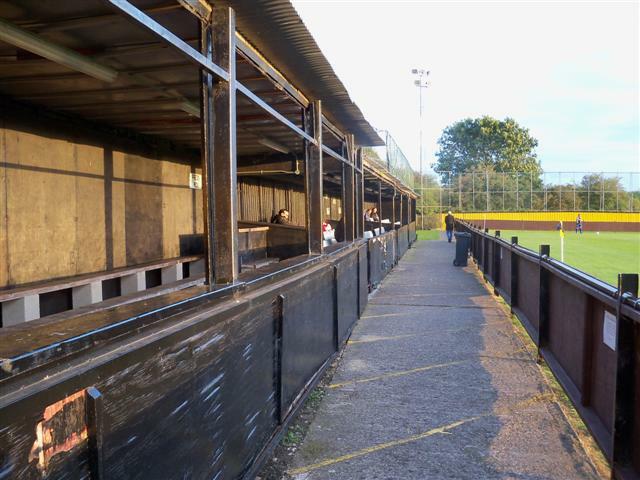 Despite the paucity of seats and structures it does boast some very plush continental dugouts. There is a large clubhouse and snack bar as you come in behind the goal. The ground was tidy and welcoming, with a good programme. The game was appalling from a Leek perspective. I don’t think I’ve ever seen such a lacklustre performance so early on in the season. They played as if they’d had 6 months confidence knocked out of them – very disappointing, as Rushall quite easily deserved their 2-0 win. This and the next few reports will be short and badly written. My apologies. I have a back log and some studies on. Normal service may resume about December time. I thought it better to get the pictures ‘out there’ if nothing else. 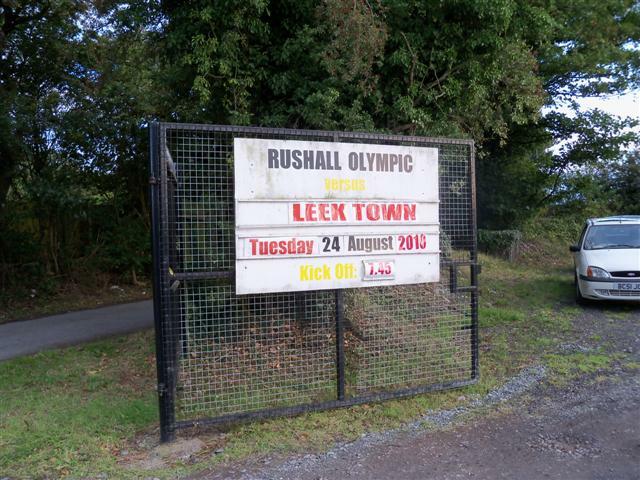 This entry was posted in Groundhopping, Non-League, Travelog and tagged dales lane, Evo Stik League, Leek Town, rushall olympic. Bookmark the permalink. Went to Rushall recently. 3-0 v high flying Buxton but the programme is an absolute gem. 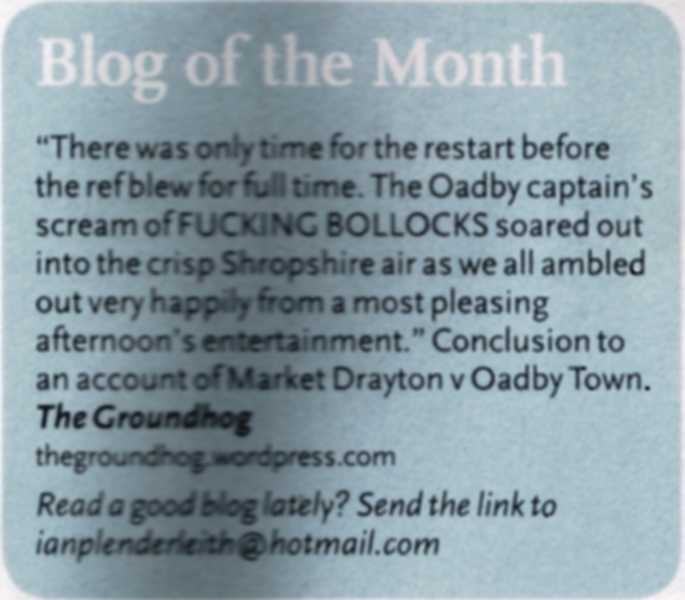 Scant praise from a professional like yourself for such a top notch publication. Being proper enthusiasts last Saturday setting off from Great Hucklow, we did Liversedge FC – game off, Pontefract Collieries backup – game off ( never trust non league websites match info) and finally game on at Penistone arrival half time. Missed 6 goals out of seven but isn’t football wonderful at lower levels. Penistone Clubhouse definite Gold Star status. Hope you haven’t mixed up any more scores since your faux-pas supreme at TIDESWELL. Keep up the good work! P.S. Quality Pies at Rushall.